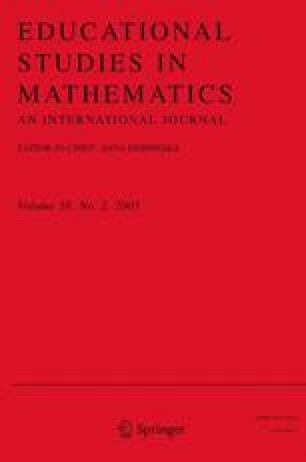 Compared to studies in general education, authority has received little attention in mathematics education, despite an increasing interest in sociological perspectives in mathematics classroom research. The subject of authority is particularly important in mathematics education, on the one hand, because of the immense authority mathematics itself seems to possess and pass on to its practitioners, but also, on the other hand, because of the anti-authoritarianism present, to some degree, in many trends in mathematics education such as cooperative learning approaches and constructivist pedagogies. Such an anti-authoritarian stance appears justified by data from an 8th grade mathematics classroom (supplemented with data from a second 8th grade classroom) which suggest that teachers possess immense authority in the eyes of the students and that this and other authority relations are strongly evident in the students’ non-reflective ways of interacting not only with their teachers but also among themselves. However, theoretical considerations on authority show that the problem may not be authority per se but the way one conceives the notion of authority, that there exist kinds of authority, such as Benne’s ‘anthropogogical’ authority, which can encourage reflective and also fruitful collaborative work.